This is a rare opportunity to purchase this newly refurbished 1 bedroom first floor apartment. It is conveniently located in the very popular William Street area of Lurgan offering immediate access to the local train station, town centre, all local amenities and the motorway network. An early interior inspection is highly recommended for the first time buyer or those seeking investment. Accommodation comprises 1 bedroom, open plan lounge/kitchen area and bathroom. This property also benefits from gas fired central heating and white PVC double glazed windows throughout. Outside there is an enclosed communal area with pathway leading to car parking area at rear. ENTRANCE HALL: White PVC panelled front door leading to staircase to first floor. LOUNGE/KITCHEN: 17’09” x 11’06”. At largest point. New fitted kitchen with low and high level units, stainless steel extractor fan, built in oven/hob, plumbed for washing machine, part laminate wooden flooring, part tiled flooring, part ceramic tiled walls, double panel radiator, power points. HALLWAY: Split level hallway part laid in laminate wooden flooring, double panel radiator, power point. BEDROOM 1: 11’04” x 7’05”. At largest point. Laminate wooden flooring, double panel radiator, power points. BATHROOM: White 3 piece suite comprising bath, pedestal wash hand basin and low flush wc, wall mounted shower and shower door over bath, ceramic tiled walls throughout. OUTSIDE: Enclosed communal area with pathway leading to car parking area at rear. OTHER: Solid white interior doors. 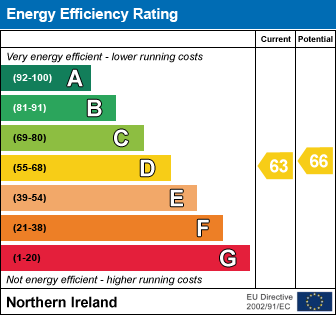 I am interested in 106C William Street, Lurgan. Please contact me about this property.